PT Pertamina Trans Kontinental - PTK Shipping or referred to as "Pertamina Shipping" is a downstream subsidiary company of state-owned oil giant PT Pertamina (Persero), running business in shipping industry. 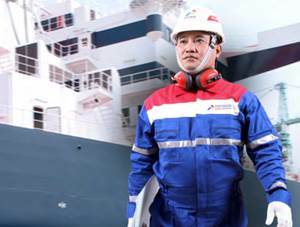 Pertamina Shipping concentrates its business activities in sea transport and maritime services. Pertamina Shipping also support offshore oil and gas explorations and handling agent of PT Pertamina (Persero) chartered and third party vessel. Pertamina Shipping’s shareholders are PT Pertamina (Persero) and PT Pertamina Training & Consulting. PT Pertamina (Persero), which owns 99.999% of Pertamina Shipping’s issued share capital, is the Indonesia's national Petroleum corporation wholly-owned by the Indonesian Government. PT Pertamina Training & Consulting owns 0.001% of Pertamina Shipping’s issued share capital and is a wholly-owned subsidiary of PT Pertamina (Persero). Pertamina Shipping started operations in 1969 as PT Pertamina Tongkang. In 2011, PT Pertamina Tongkang was officially renamed under the name of PT Pertamina Trans Kontinental. Headquartered in Jakarta, Pertamina Shipping runs its business through 26 fleets, including 4 units of Anchor Handling Tug Supply, 1unit of Multi Purpose Vessel, 4 units of Herbour Tug, 3 units of Tanker Ship, 3 units of Gas Carrier, 4 units of Tug Boats & Oil Barges, 4 units of Working Boat, and 3 units of SPOB. In term of office networks, Pertamina Shipping now has 12 work regions, namely Belawan, Batam, Dumai, Plaju, Jambi, Tanjung Priok, Surabaya, Makassar, Cilacap, Bontang, Balikpapan, and Sorong. PT Pertamina Trans Kontinental also supported by 3 subsidiaries, namely PT Peteka Karya Gapura, PT Peteka Karya Tirta, and PT Peteka Karya Samudera. In term of financial performance, Pertamina Shipping recorded excellent results. Pertamina Shipping managed to record revenue in 2014 amounted to Rp 1,347.37 billion. This reflected an 25.04% increase from Rp 1,077.55 billion in the previous year (2013). Total net income amounted to Rp191.44 billion in 2014. This represented an increase of 9.78% over net income recorded in 2013 of Rp174.38 billion, according to Pertamina Shipping Annual Report 2014 as cited by JobsCDC.com. Minimum D4/S1 or ANT III. S1 are welcome to apply (preferably from Naval Engineering). Have a GPA score min 2.50 (scale 4.00). The candidate with minimum of 2 years of sailing experience as officer or Marine Superintendent is preferred. Familiar with the end-to-end process vessel operations (including an understanding of the regulation, class), Ship Management. Minimum D4/S1 or ATT III. S1 Naval Engineering are welcome to apply. Familiar with end to end process Plan Maintenance System. JobsCDC.com now available on android device. Download now on Google Play here. Please be aware of recruitment fraud. The entire stage of this selection process is free of charge. PT Pertamina Trans Kontinental - Recruitment Professional Program Pertamina Group June 2016 will never ask for fees or upfront payments for any purposes during the recruitment process such as transportation and accommodation.